How can a man with such noble intentions to serve the society can be a FRAUD??? PRLog (Press Release) – Jul 15, 2010 – Madhu Pandit Dasa is not a fraud. He is a visionary organizational leader who has demonstrated ability in building organizations of excellence in the non-profit sector and is held in high esteem for his contribution to the society in humanitarian, cultural and spiritual spheres. He has been instrumental in conceiving and implementing many social initiatives that impact million of people in this country, giving them a better quality of life. Besides his achievements in the social sector, he has evolved innovative ideas in presenting the ancient cultural ethos of India in a modern scientific and technological context. Having found the path that answered his quest for the Absolute Truth, right after his days in IIT-Bombay, Madhu Pandit Dasa dedicated his life to serving the mission of His Divine Grace A. C. Bhaktivedanta Swami Prabhupada. He has nearly three decades of self less work behind him. Inspired by the idea of simple living and high thinking, Madhu Pandit Dasa envisioned an eco-friendly and sustainable organic farm. 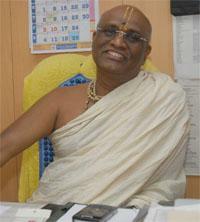 His initiatives led to creating the Hare Krishna Nature Farm, in Mysore. This concept of impacting rural development through sustainable agriculture was conceived by him long before the organized sector realized its potential.The Hare Krishna Nature Farm grew to be a model farm and a case study in sustainable and organic farming in Karnataka, specific to the farmers of dry lands. Thousands of farmers all over India have benefitted from this project. The Nature Farm believes in making a difference to the lives of farmers, who comprise over 55% of the nation’s population. It is founded on the understanding that the diverse culture of farming rests with the rural population and any drain of rural population to the urban settlement results in the extinction of the delicate and diverse cultural fabric of the nation. The motto being, ‘Taking prosperity to the door steps of farmers’. The master mind behind the world’s largest school meal program The Akshaya Patra Foundation currently feeding 1.2 million children every day across 8 states and 18 locations in India. His ambitious dream is to reach out to 5 million children by 2020.